This is a classic view of Paris from the Solferino footbridge which leads to the Tuileries gardens. Full Exif data and location coordinates. I am beginning to wonder whether I don’t love HDR best when used in black and white. 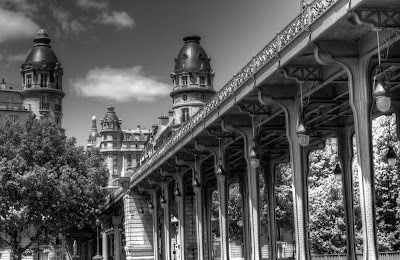 The second view is that of a Paris bridge with the HDR black & white technique is that of the Bir-Hakeim bridge, which links the left to the right bank and leads, and leads tourists (and locals) from the Eiffel Tower to the Trocadero. The area (a classic example of Art Nouveau architecture, i.e. of the beginning of the twentieth century, is also remembered for being the location of many a scene of Bertolucci’s last tango in Paris (starring Brando and Schneider).